Domingos holds a PhD in biological sciences from Universidade Estadual Paulista, UNESP. He is currently professor of the undergraduate course in Fisheries Engineering at UNESP - Campus Experimental de Registro. 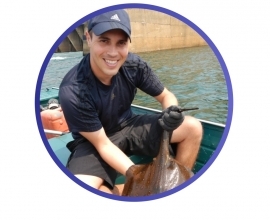 He is also professor at the graduate program in aquatic biodiversity of UNESP - Campus do Litoral Paulista, where he teaches natural history, diversity and conservation of fishes.